The coffee filter is set over this coffee mug because I broke the carafe. 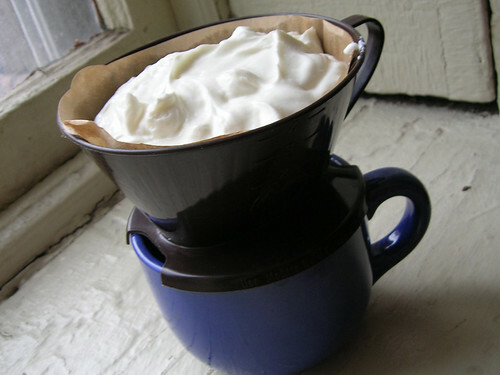 Spoon the yogurt into a coffee filter, cover with plastic wrap if desired, and put it in the refrigerator to drain overnight. In the morning, it should be about the consistency of cream cheese. It will keep in an airtight container, refrigerated, for a week. Maybe longer, I always eat it up in a week.